One of the many things I love about my job is all the different people I get to meet and the beautiful gardens I get to see. 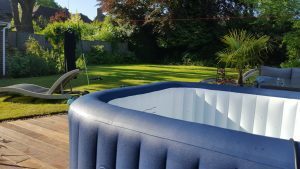 Catriona and her fantastic garden in Berkhamsted didn’t disappoint. 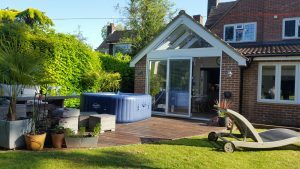 Perfectly located and looked out on from a recently extended kitchen, her patio lent itself as the perfect location for the hot tub. Hired as party of her daughters’ birthday celebrations, I heard someone stand at the door, see the tub and exclaim “You’re the best Mum ever!!”. Made me very happy! Another thing that makes mine a great job.